In a world that is increasingly ruled by technology, technical documentation is becoming ever more important. Products are also becoming more and more elaborate and complex. Proper documentation is therefore a vital component in this process, describing, explaining and documenting these products (machines, lines, equipment, devices, etc.) for all kinds of users and in all phases of a product's lifecycle. Potential hazards that may be inherent in a product, or that may occur when handling a product, must be indicated explicitly. Legislation (e.g. on product liability), standards and European Directives (European legislation) must also be strictly observed and proper documentation plays a decisive role in satisfying these requirements. The EC Machine Directive takes a very clear and distinctive position in this field. All machines that are marketed in the EU must comply with this Directive. 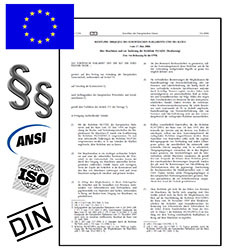 Examples of other important European directives are the EC Low Voltage Directive, the EC Pressure Equipment Directive, the ATEX Directive and the General Product Safety Directive. And furthermore, national laws and legislation, such as the applicable laws on medical equipment must be taken into account. There are also many standards (DIN, ISO, ANSI, etc.) to be taken into consideration. As they are subject to continual revisions, the people who write technical documentation (usually technical writers) must be always up to date with any changes and new developments. Our writers include long-time members of TEKOM, the German professional association for technical communication and information development. Our experienced writers will help you draw up your operating, maintenance or assembly manuals, or they can draw them up for you. 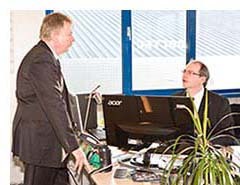 They ensure that end users can use your products safely and in accordance with their intended use. Personal injury and material damage must always be avoided. Of course, our writers are familiar with the important standards and directives and they use them as required. With the introduction of the Machine Directive came the obligation to draw up risk analyses / assessments. However, many companies still do not have the experience to draw them up themselves. Our writers can help you in that respect as well. If you only need some advice about technical documentation, then look no further. For example, if you want to have a manual that you have drawn up yourself checked for compliance with the latest new directives and standards, then please contact us. Or if you would like to start writing manuals yourself and need a crash course on to how to do this, we are always happy to advise you.